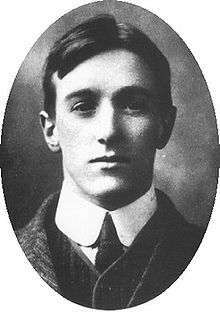 Coining the English term "historicism"
Robin George Collingwood (/ˈkɒlɪŋˌwʊd/; 22 February 1889 – 9 January 1943) was an English philosopher, historian, and archaeologist. He is best known for his philosophical works including The Principles of Art (1938) and the posthumously published The Idea of History (1946). Collingwood was born in Cartmel, Grange-over-Sands, in Lancashire, the son of the artist and archaeologist W. G. Collingwood, who had acted as John Ruskin's private secretary in the final years of Ruskin's life. Collingwood's mother was also an artist and a talented pianist. He was educated at Rugby School, and at University College, Oxford, where he gained a First in Classical Moderations (Greek and Latin) in 1910 and a congratulatory First in Greats (Ancient History and Philosophy) in 1912. Prior to graduation he was elected a fellow of Pembroke College, Oxford. Collingwood was a fellow of Pembroke College, Oxford, for some 15 years until becoming the Waynflete Professor of Metaphysical Philosophy at Magdalen College, Oxford. He was the only pupil of F. J. Haverfield to survive World War I. Important influences on Collingwood were the Italian Idealists Benedetto Croce, Giovanni Gentile and Guido de Ruggiero, the last of whom was also a close friend. Other important influences were Hegel, Kant, Giambattista Vico, F. H. Bradley and J. A. Smith. After several years of increasingly debilitating strokes Collingwood died at Coniston, Lancashire, in 1943. He was a practising Anglican throughout his life. Collingwood is widely noted for The Idea of History (1946), a work collated from various sources soon after his death by his pupil T. M. Knox. It came to be a major inspiration for philosophy of history in the English-speaking world and is extensively cited, leading commentator Louis Mink to ironically remark that Collingwood is coming to be "the best known neglected thinker of our time". Collingwood held that history could not be studied in the same way as natural science because the internal thought processes of historical persons could not be perceived with the physical senses, and past historical events could not be directly observed. He suggested that a historian must "reconstruct" history by using "historical imagination" to "re-enact" the thought processes of historical persons based on information and evidence from historical sources. Collingwood pointed out a fundamental difference between knowing things in the present (or in the natural sciences) and knowing history. To come to know things in the present or about things in the natural sciences, “real” things can be observed, as they are in existence or that have substance right now. The problem with coming to know things about history is that while past human actions actually or really happened, they took place in the past. The actions, then, have no real existence or substance at the point in time that the historian is studying them. Based on the understanding that the events and actions that historians study have already happened, they are finished and so cannot actually be observed. Collingwood maintained that historians must use their imaginations to reconstruct and understand the past. Because human events that have already taken place cannot be observed, he argued that they must be imagined. The Principles of Art (1938) comprises Collingwood's most development treatment of aesthetic questions. Collingwood held (following Croce) that works of art are essentially expressions of emotion. For Collingwood, an important social role of the artist is to clarify and articulate emotions from his or her community. Collingwood was not just a philosopher of history but also a practising historian and archaeologist. He was, during his time, a leading authority on Roman Britain: he spent his term time at Oxford teaching philosophy but devoted his long vacations to archaeology. He began work along Hadrian's Wall. The family home was at Coniston in the Lake District and his father was a leading figure in the Cumberland and Westmorland Archaeological Society. Collingwood was drawn in on a number of excavations and put forward the theory that Hadrian’s Wall was not so much a fighting platform but an elevated sentry walk. He also put forward the suggestion that Hadrian's defensive system also included a number of forts along the Cumberland coast. His final and most controversial excavation in Cumbria was that of a circular ring ditch near Penrith known as King Arthur's Round Table (henge) in 1937. It appeared to be a Neolithic henge monument, and Collingwood’s excavations, failing to find conclusive evidence of Neolithic activity, nevertheless found the base of two stone pillars, a possible cremation trench and some post holes. Sadly, his subsequent ill health prevented him undertaking a second season so the work was handed over to the German prehistorian Gerhard Bersu, who queried some of Collingwood’s findings. However, recently, Grace Simpson, the daughter of the excavator F.G. Simpson, has queried Bersu's work and largely rehabilitated Collingwood as an excavator. He also began what was to be the major work of his archaeological career, preparing a corpus of the Roman Inscriptions of Britain, which involved travelling all over Britain to see the inscriptions and draw them; he eventually prepared drawings of nearly 900 inscriptions. It was finally published in 1965 by his student R.P. Wright. He also published two major archaeological works. The first, somewhat surprisingly for a philosopher was The Archaeology of Roman Britain, a handbook in sixteen chapters covering first the archaeological sites (fortresses, towns and temples and portable antiquities) inscriptions, coins, pottery and brooches. Mortimer Wheeler in a review, remarked that "it seemed at first a trifle off beat that he should immerse himself in so much museum-like detail… but I felt sure that this was incidental to his primary mission to organise his own thinking". However, his most important work was his contribution to the first volume of the Oxford History of England, Roman Britain and the English Settlements of which he wrote the major part, Nowell Myres adding the second smaller part on English settlements. The book was in many ways revolutionary for it set out to write the story of Roman Britain from an archaeological rather than a historical viewpoint, putting into practice his own belief in 'Question and Answer' archaeology. The result was alluring and influential. However, as Ian Richmond wrote: 'The general reader may discover too late that it has one major defect. It does not sufficiently distinguish between objective and subjective and combines both in a subtle and apparently objective presentation'. The most notorious passage is that on Romano-British art; he says: "The impression that constantly haunts the archaeologist, like a bad smell, is that of an ugliness that plagues the place like a London fog". Collingwood’s most important contribution to British archaeology was his insistence on Question and Answer archaeology: excavations should not take place unless there is a question to be answered. It is a philosophy which, as Anthony Birley points out, has been incorporated by English Heritage into the conditions for Scheduled Monuments Consent. Still, it has always been surprising that the proponents of the "new" archaeology in the 1960s and the 70s have entirely ignored the work of Collingwood, the one major archaeologist who was also a major professional philosopher. Arthur Ransome was a family friend, and learned to sail in their boat, subsequently teaching his sibling's children to sail. Ransome loosely based the Swallows in Swallows and Amazons series on his sibling's children. 1 2 Collingwood himself used the term "historicism"—a term he apparently coined—to describe his approach—for example in his 'Ruskin's Philosophy', lecture delivered to the Ruskin Centenary Conference Exhibition, Coniston, Cumbria (see Jan van der Dussen, History as a Science: The Philosophy of R.G. Collingwood, Springer, 2012, p. 49)—, but some later historiographers describe him as a proponent of "historism," in accordance with the current meaning of the term in English (see F. R. Ankersmit, Sublime Historical Experience, Stanford University Press, 2005, p. 404). ↑ A translation of the German Historismus first coined by Karl Wilhelm Friedrich Schlegel (see Brian Leiter, Michael Rosen (eds. ), The Oxford Handbook of Continental Philosophy, Oxford University Press, 2007, p. 175: "[The word 'historicism'] appears as early as the late eighteenth century in the writings of the German romantics, who used it in a neutral sense. In 1797 Friedrich Schlegel used 'historicism' to refer to a philosophy that stresses the importance of history..."). ↑ Mink, Louis O. (1969). Mind, History, and Dialectic. Indiana University Press, 1. ↑ R. G. Collingwood (2005). "Man Goes Mad" in The Philosophy of Enchantment. Oxford University Press, 318. ↑ Introductory essay in R. G. Collingwood, An Autobiography, Oxford University Press. Wikimedia Commons has media related to R. G. Collingwood. D'Oro, Giuseppina. "Robin George Collingwood". Stanford Encyclopedia of Philosophy. Kemp, Gary. "Collingwood's Aesthetics". Stanford Encyclopedia of Philosophy.